Ms. Agatha Harrison Memorial Fellowship is Available Now!!! Here is the great opportunity for all those candidates who want to take admission in research programmes at the St. Antony’s College, Oxford. If you are also one them who have specialized in stream of the History, Economics and Political Science, they can apply for Ms. Agatha Harrison Memorial scholarship Online Application Form 2018-19 accurately through the link which is mention at the bottom of the page.We suggested to every eligible candidates can check the complete registration process, eligibility criteria, how to apply online. Ministry of Human Resource, Government of the India had issued Ms. Agatha Harrison Memorial Scholarship for 1 year in the first instance, which can be extensive by o1 year more on the basis applicants performance. . Before applying for Ms. Agatha Harrison Memorial 2018 Fellowship can check the complete registration process, eligibility criteria, how to apply online which is mention below. Eligibility Criteria for Ms. Agatha Harrison Memorial Fellowship. Aspirants must have Post Graduation with 60% (at least) and a Ph.D. degree in concern field from recognized university. Aspirants who have foreign degrees and diplomas are also eligible but applicants should have valid proof of equivalence furnished by the Competent Authority. The aspirants must have finished tertiary Education in English Medium only. Age limit: Between 30 to 40 years. Applicants will be selected on the basis of the application form and personal interview process. Selected applicants name will be displayed on the Ministry’s website www.mhrd.gov.inlscholarships. Also shortlisted candidates will be email from organization in concern of their selection. Then need to visit the proposal.sakshat.ac.in/scholarship. Find the ‘Ms. 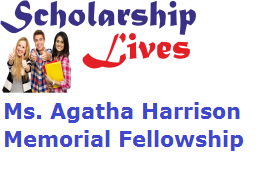 Agatha Harrison Memorial Fellowship – 2018’ and select link ‘New Registration’. Then Upload your Self attested certificates/degrees including date of birth, mark-sheets in respect of all the Examinations passed, experience certificate of Employment. Finally submit precise programme of study/ research (minimum 500 words) and justification of their study/ research being carried out in the United Kingdom.